As you’re probably well aware, the next few weeks are going to be exciting if you’re a fan of the Force. Whether you’re hankering for Han Solo, looking out for Luke Skywalker or even craving some Kolo Ren, we’ve got the perfect giveaway for you. 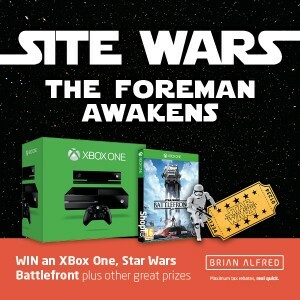 To celebrate the launch of Star Wars, The Force Awakens (and because our rebates are out of this world), one lucky winner will be walking away with an Xbox One, Star Wars Battlefront and two tickets to see the film! We’re calling it Site Wars, a Star Wars-themed competition just for contractors in the construction and mechanical trade. To enter the Site Wars competition, simply head on over to our Facebook Page and give our post a like to win. And while you’re at it, why not share it and tag a mate who could do with a rebate? The Force is definitely strong with Brian Alfred. Site Wars giveaway competition. Nice one Brian! The prize draw is open to customers of the Promoter who have liked the Promoters Facebook post from the 3rd December to the 17th December 2015. Entry is free and limited to one entry per taxpayer. The closing date of the prize draw is 23:59 on 17th December 2015. Entries received outside this time will not be considered. The draw will take place on the 18th December, 2015. One winner will be chosen from a random draw of entries received in accordance with these Terms and Conditions. The prize must be taken as stated; no exchange, cash alternative or other substitution will be offered. Entrants must be aged 18 years or over and a resident of the UK. Restrictions may apply according to the terms and conditions of the company providing the prize. If the winner cannot be contacted within 7 days of the closing date, the Promoter reserves the right to conduct a second draw. The winner will receive a voucher for the value of two tickets for the filming of Star Wars, The Force Awakens and a chosen cinema, which will be sent to the winner by post. The Promoter reserves the right to substitute a prize of equal or greater value at any time. The Promoter of this competition is Brian Alfred Associates Ltd, registered under company number 5578165 whose registered office is at Optionis House, 840 Ibis Court, Centre Park, Warrington, WA1 1RL. This prize draw will be governed by English Law.